Summer's produce crop may be long gone, but that doesn't mean you can't load up on these healthy autumn choices. Sweater weather might be upon us, but your fruit and vegetable choices are just starting to heat up! When most people think of farm-fresh food, they imagine sun-kissed peaches and juicy tomatoes. But come the fall season, markets are once again bursting with a bounty of fruits and vegetables at their nutrition and flavor peaks. You can't feed your muscles with only steak and eggs, so to help send you into winter as healthy (and well-fed!) as ever, we rounded up the fairest fruits and veggies of the fall that pack a legitimate nutritional punch. When it comes to fall fruit, here's more proof that you should think beyond apples. Juicy pears are a stellar source of dietary fiber—a medium fruit delivers about 6 grams. That's 50 percent more than what you get from an apple, and more than an entire cup of cooked quinoa. Current recommendations are that men and women should be shooting for 38 grams and 25 grams of fiber daily, respectively. So biting into a hazardously juicy pear can help you nail this quota. Like a death threat from Hulk Hogan, there are copious reasons why you shouldn't take your fiber intake lightly. For starters, fiber takes a sledgehammer to hunger pangs by slowing down digestion, thereby helping you feel full for longer and putting the brakes on cravings and overeating. Fiber also reduces nasty spikes in blood sugar that can contribute to sagging energy levels and the storage of doughy stuff on your six-pack. Juicy pears are a stellar source of dietary fiber—a medium fruit delivers about 6 grams. That's 50 percent more than what you get from an apple, and more than an entire cup of cooked quinoa. By working to improve blood cholesterol numbers, research also suggests that a high-fiber diet can help lessen the risk of suffering coronary woes. And keep the peeler in the drawer: The skin of a pear harbors a laundry list of antioxidants with inflammation-fighting powers. 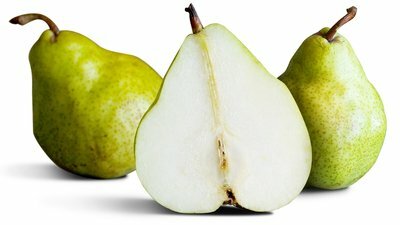 Bartlett's are the most popular pear, but expand your culinary horizons with Bosc, Anjou, and the deliciously crisp Seckel. Beyond being an ideal out-of-hand snack, sliced pears can also add a sweet appeal to oatmeal, yogurt, cottage cheese, green salads, and even sandwiches. Blend them into your protein shakes to add natural sweetness. We know kale is a cliche choice these days, but hear us out. Few foods provide more of a nutritional bang for your buck, making jaunty kale the MVP of the produce department. A mere cup of this green giant delivers more than a day's requirement of vitamins K, A, and C.
Researchers at Arizona State University discovered that higher intakes of vitamin C can reduce heart rate during exercise, which could make your workouts seem less taxing and allow you to push the pace. Kale is also a leading source of lutein and zeaxanthin, a dynamic antioxidant duo shown to bolster eye health. Some people find raw kale too bitter for their taste buds, but steaming or quickly sauteing the leaves can mellow out its flavor. Try kale served with roasted butternut squash. Add chopped kale to soups toward the end of cooking, or add it in pesto sauces. Kale also makes a powerful addition to so-called green smoothies. Food blogs are packed with kale chip recipes that'll turn into your new snacking addiction. It's time to dig deep for one of the season's best finds. Who would have thought that a root vegetable synonymous with borsht would turn out to have what it takes to rev up your workouts? A number of recent studies, however, have shown that regular consumption of whole beets and beet juice can improve muscular endurance. How? It turns out that the crimson vegetable is jam-packed with nitrates, which the body converts into nitric oxide, a gas that widens blood vessels—much like the nitric-oxide supplement you may already be taking. This, in turn, allows more oxygen and nutrients to get to your muscles during workouts, and thereby generates more efficient muscular energy production. As a bonus, the nitrates in beets have blood-pressure-lowering efficacy, and betalins—pigments that give the root vegetable its distinctive blush—are strong antioxidants. And since beets have among the highest natural sugar content of any vegetable, they can help stick it to cravings for nutritionally corrupt sweets. Beets are jam-packed with nitrates, which the body converts into nitric oxide, a gas that widens blood vessels—much like the nitric-oxide supplement you may already be taking. To coax out their natural sweetness, roasting beets is the way to go. Simply wrap each beet tightly in foil or parchment paper and bake at 350 degrees Fahrenheit until tender—about one hour, depending on their size. When cool enough to handle, the skins will rub off using a paper towel. Shredded raw beets are a great addition to salads and sandwiches. Some athletes sip beet juice, a concentrated source of nitrates, on a daily basis for its performance-boosting powers. You can find dried, sugar-coated cranberries all year, but now is the time to pucker up and enjoy the uncompromised fresh version. Native to North America and oh-so autumnal, distinctively tart cranberries are laced with phytonutrients with strong antioxidant power. By helping to lessen the oxidative damage associated with intense workouts, it's thought that higher intakes of antioxidants like those in cranberries can help improve exercise recovery. What's more, a large review of studies conducted by researchers at Boston's Tufts University suggests that unique proanthocyanidin antioxidants found in spades in cranberries are cardio-friendly via their power to reduce inflammation, cholesterol, and artery stiffness. The rosy gems are also a good way to load up on more immune-boosting vitamin C, which can help combat the winter sniffles so you can spend more time on the gym floor than the doctor's office. Fresh cranberries can add a pop of unexpected tart flavor to salsas, grain, and green salads, or even when mixed with ground beef to make hamburger patties. Try simmering them in a saucepan with chopped apple, chopped shallot, orange zest, maple syrup, and cinnamon for a sauce that can breathe new life into your yogurt, oatmeal, or cottage cheese. It even works as a sauce for meats like pork and chicken. Now's the time to load up on this winter squash, when prices at markets are budget-friendly. Butternut's orange-tinged flesh should tip you off that it's full of beta-carotene. In the body, beta-carotene can be converted to vitamin A, which is used to bolster eye, bone, and immune health. On its own, beta-carotene is considered an antioxidant that can help mop up cell-damaging free radicals. Butternut's orange-tinged flesh should tip you off that it's full of beta-carotene. A 2014 "Journal of Nutrition" study reported that higher blood levels of beta-carotene are associated with lower levels of LDL (bad) cholesterol and markers of inflammation, making this gourd particularly heart-friendly. Butternut also delivers fiber, vitamin C, vitamin B6, and magnesium. Scientists in Portugal found that magnesium plays a role in muscular strength in athletes, potentially via its impact on muscle contraction. If stored in a dry, cool, well-ventilated place, hearty butternut squash can last up to three months. Roasting winter squash for recipes serves to intensify their natural sweet side. Toss halves, slices, or chunks with some oil and bake at 400 degrees Fahrenheit until tender. Use in salads, soups, and even tacos. Cooked and pureed butternut can also gussy up your morning oatmeal, and is surprisingly amazing in smoothies when blended with Greek yogurt, frozen banana, almond butter, and cinnamon. When shaved thinly with a vegetable peeler, ribbons of sweet raw squash can even be used to add excitement to salads. In case you're still hankering for summer fruits like peaches and blueberries this fall, it's best to take a pass on lackluster fresh imports in favor of their frozen counterparts. While fresh fruits can lose some of their nutritional firepower (not to mention flavor) during their long trip from farm to store to shelves, frozen fruits are most often picked at their height of ripeness and then quickly frozen to lock in their nutrients and antioxidants.